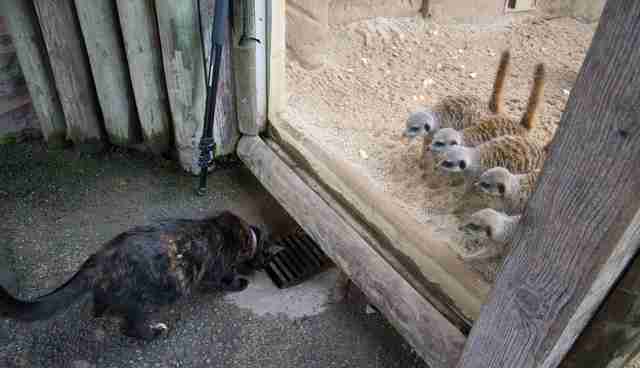 A cat recently found his way into the Chester Zoo in England and wandered up to the meerkat enclosure. He got some VERY strong reactions. Photographer Tim Furfie was hanging out at the zoo, taking snapshots of the meerkats, when the cat came into the exhibit, looking for attention. "Opposite the meerkat enclosure at the Chester Zoo is an open field so I assume that is where the cat got in," Furfie told The Dodo. "The zoo is very close to houses so I imagine the cat belongs to one of those." At first, the cat wasn't all that interested in the meerkats and was focused on getting pets from the guests instead - but the meerkats noticed the cat right away. "The meerkats were very inquisitive and more and more made their way over. Then the cat got rather inquisitive too, and it was prowling up and down the glass enclosure watching them follow it," Furfie said. 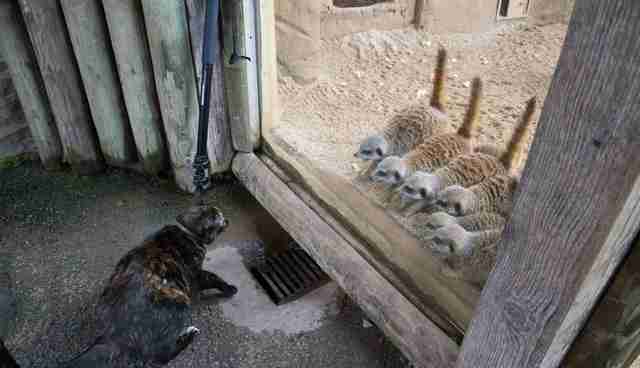 When the cat wasn't looking for a second, the meerkats took the opportunity to try and pounce at him from behind the glass, which immediately startled him and sent him running away. 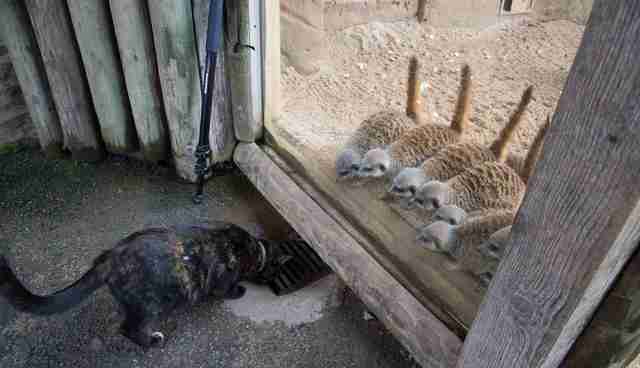 The poor meerkats had to watch their new friend run away, while they were stuck watching from behind the glass. Unfortunately, that's what happens when you're an animal kept in captivity. 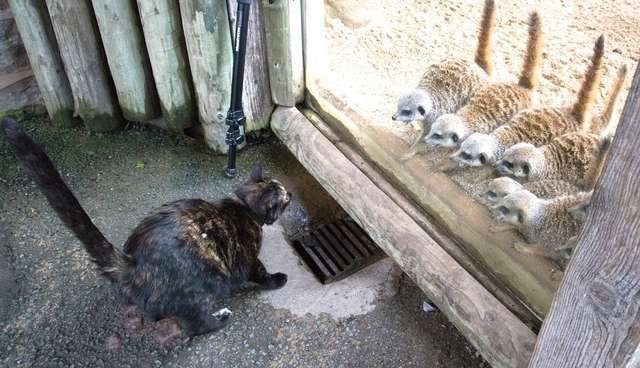 Both the meerkats and the cat seemed very startled to learn of the other's existence, and this will likely be a meeting that none of them will ever forget.